Determination of the fastest rail vehicle in the world varies depending on the definition of "rail". The world record for conventional wheeled passenger trains is held by France's specially tuned TGV (Train à Grande Vitesse). Reduced to three cars, it broke the world record in April 2007, reaching 574.8 km/h (357.2 mph) on a 140 km section of track. The maximum speed attained by a passenger train is held by Japan's experimental maglev train L0 Series, having achieved 603 km/h (375 mph) on a 42.8 km magnetic levitation track in April 2015. 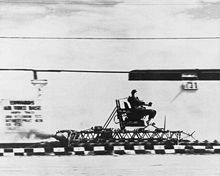 The fastest manned rail vehicle was a manned rocket sled, which carried United States Air Force flight surgeon Colonel John Stapp at 1,017 km/h (632 mph). Unmanned rocket sleds that ride on rails have reached over 10,400 km/h (6,460 mph), equivalent to Mach 8.5. Arr (Arrangement) : Disposition and number of elements forming the train. Power: DC, DC 3rd rail, AC, Single phase, Triphase, Diesel-elec., Gas, Steam, Diesel-hydraulic, Propeller, Rocket, Jet. State: "Proto." (Prototype), "Unmod." (Unmodified from vehicles in service), "unknown" (Unknown), "Tuned"
581 km/h (361 mph) 2003-12-02 Yamanashi Test Track Japan MLX01 Multi AC (Maglev) Proto. Three-car train set. Guinness Book of Records authenticated. 574.8 km/h (357 mph) 2007-04-03 LGV Est France SNCF TGV POS Set No. 4402 Multi AC Tuned Set formed of 2 power cars + 3 trailers. Current world record on steel rails. 552 km/h (343 mph) 1999-04-14 Yamanashi Test Track Japan MLX01 Multi AC (Maglev) Proto. Five-car train set. Guinness Book of Records authenticated. 550 km/h (342 mph) 1997-12-24 Yamanashi Test Track Japan MLX01 Multi AC (Maglev) Proto. Three-car train set. 515.3 km/h (320 mph) 1990-05-18 LGV Atlantique France SNCF TGV Atlantique Set No. 325 Multi AC Tuned Set formed of 2 power cars + 3 trailers. 482.4 km/h (300 mph) 1989-12-05 LGV Atlantique France SNCF TGV Atlantique Set No. 325 Multi AC Tuned Set formed of 2 power cars + 3 trailers. 421.4 km/h (262 mph) 2013-03-28 Gyeongbu high-speed railway South Korea Hyundai Rotem HEMU-430X Multi AC Proto six-car train set. maximum speed test. 393.8 km/h (245 mph) 2016-02-26 AV Milano-Torino Italy ETR 1000 Multi AC Unmod. 362 km/h (225 mph) 2009-02-04 Monte Bibele tunnel (Bologna-Firenze HSL) Italy ETR 500-Y Multi AC Tuned World record in tunnel. 331 km/h (206 mph) 1955-03-29 "Les Landes", between Bordeaux and Dax France Jeumont-Schneider BB 9004 Loc DC Tuned Pulling 3 cars. Train was specially modified for the test. The track was badly damaged by the test. 245 km/h (152 mph) 1980 Rosslyn to De Wildt South Africa South Africa South African Class 6E Loc DC Proto. High speed pantographs was tested for British rail on locomotive number E1525. The idea was abandoned thereafter. 202.58 km/h (126 mph) 1938-03-07 East Coast Main Line between Peterborough and Grantham UK LNER Class A4 4468 Mallard Loc Steam unknown Authenticated speed. International Steam Record Holder to this day. 177 km/h (110 mph) 1945-3-30 Fort Wayne Line US Pennsylvania Railroad Class S2 #6200 Loc Steam Turbine Unmod. During a test run officially arranged by PRR on 30 March 1945, S2 #6200 with a dynamometer car towed, was able to pull a 17-car train over a distance of 48 kilometers at a speed of 110 mph (180 km/h) between Fort Wayne and Chicago. Ernest F G Cox, a British locomotive engineer, once travelled on the footplate and reported that "100mph was maintained and exceeded for 12 consecutive minutes". 168.5 km/h (105 mph) 1934-30-11 East Coast Main Line near Essendine UK LNER Class A3 4472 Flying Scotsman Loc Steam Unmod. First authenticated run at over 100 mph with complete, surviving documentation. 164 km/h (102 mph) 1971-10 Krauss-Maffei's plant in Munich - Allach West Germany Transrapid 02 Single AC (Maglev) Proto. 930 m test track which included one curve. 161 km/h (100 mph) 1934-11-30 East Coast Main Line UK LNER Class A3 4472 Flying Scotsman Loc Steam Unmod. In 1934, Flying Scotsman achieved the first authenticated 100 mph (161 km/h) by a steam locomotive. 96.6 km/h (60 mph) 1848 US Boston and Maine Railroad Antelope Loc Steam Unmod. First authenticated 60 mph (97 km/h),26 miles (42 km) in 26 minutes. 90 km/h (56 mph) 1971-05-06 MBB's Ottobrunn factory West Germany MBB Prinzipfahrzeug Single AC Proto. 660 m test track. Near Munich. MBB: Messerschmidt-Bölkow-Blohm, Prinzipfahrzeug: Principle vehicle. The following is a list of verified absolute world speed records for conventional wheeled rail vehicles. 202.6 km/h (126 mph) 1938-07-03 UK LNER Class A4 No. 4468 Mallard Loc Steam unknown  Downhill grade. Data indicates peak speed 202.6 km/h (126 mph), mean speed (half-mile) 201.2 km/h (125 mph). Mallard suffered an overheated crankpin during the run, but was repaired and returned to traffic within 9 days. This is the standing record for a steam locomotoive. 180.3 km/h (112 mph) 1935-09-29 East Coast Main Line between Biggleswade and Sandy UK LNER Class A4 2509 Silver Link Loc Steam unknown Authenticated speed. Some sources say 112.5 mph. 168.5 km/h (105 mph) 1935-03-05 East Coast Main Line near Essendine UK LNER Class A3 No. 2750 Papyrus Loc Steam Unmod. First authenticated run at over 100 mph with complete, surviving documentation. The following is a list of speed records for rail vehicles with electric traction motors and powered by electricity transferred to the train. 574.8 km/h (357 mph) 2007-04-03 LGV Est France SNCF TGV POS Set No. 4402 Multi Single phase Tuned Set formed of 2 power cars + 3 trailers. Current world record. 515.3 km/h (320 mph) 1990-05-18 LGV Atlantique France SNCF TGV Atlantique Set No. 325 Multi Single phase Tuned Set formed of 2 power cars + 3 trailers. 482.4 km/h (300 mph) 1989-12-05 LGV Atlantique France SNCF TGV Atlantique Set No. 325|- Multi Single phase Tuned Set formed of 2 power cars + 3 trailers. 421.4 km/h (262 mph) 2013-03-28 Gyeongbu high-speed railway South Korea Hyundai Rotem HEMU-430X Multi Single phase Proto six-car train set. maximum speed test. 362 km/h (225 mph) 2009-02-03 Between Florence and Bologna Italy ETR 500 Y1 Multi Single phase Tuned Indoor Italian speed record, in the Monte Bibele tunnel on the high speed line between Florence and Bologna. 357 km/h (222 mph) 2006-09-02 Nuremberg-Munich high-speed rail line Germany Siemens EuroSprinter ES64U4 No. 1216 050-5 Loc Single phase Unmod. On Nuremberg-Munich high-speed rail line, locomotive owned by ÖBB, pulling one car. 210.2 km/h (131 mph) 1903-10-28 Royal Prussian Military Railway between Marienfelde and Zossen Germany AEG Experimental three-phase railcar Multi Triphase Proto. Many sources say 27 October. 203 km/h (126 mph) 1903-10-06 Royal Prussian Military Railway between Marienfelde and Zossen Germany Siemens & Halske Experimental three-phase railcar Multi Triphase Proto. Some sources say 7 October, others say 200.99 km/h (125 mph) or an improbable 231 km/h (144 mph). 162.5 km/h (101 mph) 1901 Royal Prussian Military Railway between Marienfelde and Zossen Germany Siemens & Halske Experimental three-phase railcar Multi Triphase Proto. Some sources say 160 km/h (99 mph) or 162 km/h (101 mph). The following is a list of speed records for rail vehicles with on-board fuel to generate electricity for traction motors such as diesel-electric locomotive, diesel electric multiple unit and gas turbine-electric locomotive trains. The following is a list of speed records for rail vehicles with on-board fuel to mechanical energy to drive vehicle's wheels such as diesel-hydraulic trains and gas turbine locomotive trains that use mechanical transmission to power the drive wheels. The following is a list of speed records for steam locomotives. Note: All records with a faster speed than 202.6 km/h (126 mph) (the record set by Mallard) are claimed and have not been officially verified. 251 km/h (156 mph) 1945 Fort Wayne Line US Pennsylvania Railroad Class S1 #6100 Loc Steam Unmod. Claimed. The locomotive was claimed to have exceeded 156 mph (251 km/h) on the Fort Wayne-Chicago run, as it was reported that the PRR received a fine for the feat. An article "Riding the Gargantua of the Rails" in the Dec 1941 Popular Mechanics Magazine cites a speed of 133.4 miles per hour (214.7 km/h). In the German trade press and literature from 1945 there was a report of a record run of the S1, citing railroad officials that a speed of 141 mph (227 km/h) had been reached. 225 km/h (140 mph) 1948 US Pennsylvania Railroad Class T1 Loc Steam Unmod. Claimed. A technician charged with determining the cause of frequent poppet valve failures on the T1s claimed to have observed them being operated at speeds of up to 140 mph (225 km/h) to make up time. 202.6 km/h (126 mph) 1938-07-03 East Coast Main Line UK LNER Class A4 No. 4468 Mallard Loc Steam Unmod. Downhill grade. Data indicates peak speed 202.6 km/h (126 mph), mean speed (half-mile) 201.2 km/h (125 mph). Mallard suffered an overheated center big end bearing (or crankpin) during the run, but was repaired and returned to traffic within 9 days. Mallard's record is the standing world speed record for a steam locomotive. 200.4 km/h (125 mph) 1936-05-11 Germany Borsig DRG series 05 002 Loc Steam unknown Level grade. 185.07 km/h (115 mph) 1905-06-11 US Pennsylvania Railroad E2 #7002 Loc Steam Unmod. Claimed. Clocked at Crestline, Ohio at 127.1 mph (205 km/h) in 1905. However PRR Steam Locomotives did not carry speedometers at that time, speed was calculated by measuring time between mile markers, so this is not recognized as a speed record. 182.4 km/h (113 mph) 1972-10-11 Germany BR 18 201 Loc Steam expired The fastest operational steam locomotive as of 2011[update].. After expiration of the frame and vessel licences end of 2018 the locomotive now (2019) is stored. Title of "fastest steam locomotive ready-to-run" actually is vacant. 181.1 km/h (113 mph) 1935-04-05 US Milwaukee Road class A #2 Loc Steam unknown Claimed to have sustained 112.5 mph (181 km/h) for 14 miles (23 km). Average speed for 136 miles (219 km) between Milwaukee and New Lisbon, Wisconsin was 74.9 mph (121 km/h). 180.3 km/h (112 mph) 1935-09-29 East Coast Main Line UK LNER Class A4 2509 Silver Link Loc Steam unknown Authenticated. Some sources say 112.5 mph. 168.5 km/h (105 mph) 1935-03-05 UK LNER Class A3 No. 2750 Papyrus Loc Steam Unmod. First run at 100+ mph with complete, surviving documentation. 166.6 km/h (104 mph) 1934-07-20 US Milwaukee Road class F6 #6402 Loc Steam Unmod. A point between Oakwood, Illinois and Lake, Wisconsin. Also averaged 75.5 mph (122 km/h) on 85 miles (137 km) from Chicago, Illinois to Milwaukee, and 89.92 mph (145 km/h) for a 68.9 miles (110.9 km) stretch. This trip was a test run for the feasibility of a new planned high speed passenger train service between Chicago and Minneapolis-St. Paul via Milwaukee, which came to fruition the next year as the Hiawatha. 164 km/h (102 mph) 1904-05-09 UK GWR 3700 Class 3440 City of Truro Loc Steam Unmod. Claimed to be the first steam locomotive to reach 100 mph (161 km/h). 161 km/h (100 mph) 1934-11-30 UK LNER Class A3 4472 Flying Scotsman Loc Steam Unmod. In 1934, Flying Scotsman achieved the first authenticated 100 mph (161 km/h) by a steam locomotive. 145 km/h (90 mph) 1895-08-22 UK LNWR No. 790 Hardwicke Loc Steam Unmod. Maximum speed claimed, although average speed record was authenticated. 131 km/h (81 mph) 1893-05-10 US Empire State Express No. 999 Loc Steam Unmod. 112 mph (180 km/h) claimed, which would make it the first wheeled vehicle to exceed 100 mph (161 km/h). The following is a list of speed records for rail vehicles that use air propulsion to move rail vehicles while the wheels are rolling along the track. 280 km/h (174 mph) 1928-06-23 Germany Opel RAK III Loc Rocket Proto. Unmanned. Some sources say 254 km/h (158 mph) or 290 km/h (180 mph). See:, . 230.2 km/h (143 mph) 1931-06-21 Berlin - Hamburg Germany Schienenzeppelin Single Propeller Proto. Propeller-pushed railcar with a gasoline (petrol) aero engine. Engine by BMW. 140 km/h (87 mph) 1921-07-24 Moscow-Tula Soviet Union Aerowagon Single Propeller Proto. Propeller-driven railcar with a gasoline (petrol) aero engine. Using an air cushion and a Monorail, the Aérotrain set on 5 March 1974 a mean speed of 417.6 km/h (259.5 mph) and a peak speed of 430.4 km/h (267.4 mph). 136 km/h (85 mph) 1914 South-West Africa OMEG Rail motor coach No. «Kronprinz» Single Gasoline unknown 600 mm (1 ft 11 5⁄8 in) Summer 1914. 581 km/h (361 mph) 2003-12-02 Yamanashi Test Track Japan MLX01 Multi AC Proto. Three-car train set. Guinness Book of Records authenticated. 552 km/h (343 mph) 1999-04-14 Yamanashi Test Track Japan MLX01 Multi AC Proto. Five-car train set. Guinness Book of Records authenticated. 550 km/h (342 mph) 1997-12-24 Yamanashi Test Track Japan MLX01 Multi AC Proto. Three-car train set. 164 km/h (102 mph) 1971-10 Krauss-Maffei's plant in Munich - Allach West Germany Transrapid 02 Single AC Proto. 930 m test track which included one curve. 10,326 km/h (6,416 mph) 2003-04-29 Holloman Air Force Base US Rocket sled Single Rocket Proto. Unmanned. 6,416 mph (10,326 km/h) = Mach 8.4. Final stage of a four-stage sled train. Super Roadrunner rocket motor. 192 lb (87 kg) payload. For more than 2 miles (3 km) the sled was in a helium tube to reduce air friction. 9,845 km/h (6,117 mph) 1982-10 Holloman Air Force Base US Rocket sled Single Rocket Proto. Unmanned. It accelerated a 25 lb (11 kg) payload to a speed of 6,119 mph (9,848 km/h). 4,972 km/h (3,089 mph) 1959 China Lake, California US Rocket sled Single Rocket Proto. Unmanned. On SNORT (Supersonic Naval Ordnance Track). 1,017 km/h (632 mph) 1954-12-10 Holloman Air Force Base US Rocket sled Single Rocket Proto. Manned by John Stapp. Fastest manned rocket-sled. Fastest manned rail vehicle. Fastest manned open-cockpit vehicle. Zero to 1,017 km/h (632 mph) and back to zero in 1,100 metres (3,500 ft) total. The following are the lists of world record average operating speeds between two stations. The average speeds are measured by the total time and the distance between the two stations. 313.0 km/h (194 mph) 350 km/h (217 mph) CRH2 Single phase China Wuhan Guangzhou North 922.0 km (573 mi) 2009 2011 On Wuhan-Guangzhou High-Speed Railway until July 2011. 130.4 km/h (81 mph) 161 km/h (100 mph) Morning Hiawatha Steam United States Sparta, Wisconsin Portage, Wisconsin 126.0 km (78 mi) 1939 ? 78.3 miles (126.0 km) in 58 minutes, Milwaukee Road class F7. 114.8 km/h (71 mph) 148.7 km/h (92 mph) Cheltenham Spa Express Steam United Kingdom Swindon London 124.3 km (77 mi) 1932 1933 77.25 miles (124.32 km) in 65 minutes. Claimed by the Great Western Railway at the time to be the world's fastest train. Now operated by First Great Western in 57 minutes with Class 43 HST. ^ "French train breaks speed record". CBC News. 3 April 2007. Retrieved 1 October 2013. ^ a b c "Japan's maglev train breaks world speed record with 600km/h test run". The Guardian. United Kingdom: Guardian News and Media Limited. 21 April 2015. Retrieved 21 April 2015. ^ a b リニア「Ｌ０系」、世界最高の５９０キロ記録 [L0 series maglev sets world speed record of 590 km/h]. Yomiuri Online (in Japanese). Japan: The Yomiuri Shimbunl. 16 April 2015. Archived from the original on 16 April 2015. Retrieved 17 April 2015. ^ a b リニアが世界最速５９０キロ　長距離走行記録も更新 [Maglev sets new world record of 590 km/h - Also sets new distance record]. Sankei News (in Japanese). Japan: The Sankei Shimbun & Sankei Digital. 16 April 2015. Archived from the original on April 16, 2015. Retrieved 17 April 2015. ^ a b c "BBC NEWS - Europe - French set new rail speed record". Retrieved 24 April 2015. ^ a b "Transrapid stellt neuen Weltrekord auf". Handelsblatt. 12 November 2003. Retrieved 8 September 2013. ^ 柴永強 (2011-01-13). ""唐山造"動車最高速487.3公里 刷新世界紀錄_中國網". Big5.china.com.cn. Retrieved 2012-02-10. ^ "和谐号CRH380A打破此前的世界铁路最高运营速度纪录_财经频道_新华网". News.xinhuanet.com. 2010-11-30. Retrieved 2012-02-10. ^ a b c Johnson, R. D. (1988). "Thoughts at 160 mph". Proceedings of the American Railway Engineering Association. 89: 330–331. Retrieved 2010-09-11. ^ "Due record in prova per il Frecciarossa" (in Italian). Repubblica. 2009-02-04. Retrieved 2009-02-05. ^ a b c d "Taurus puts 1955 French speed record holders in the shade". Railway Gazette International. Retrieved 8 September 2013. ^ a b c d e Scribbins, Jim (2007) . The Hiawatha Story. Minneapolis, MN: University of Minnesota Press. ISBN 0-8166-5003-9. OCLC 191732983. ^ a b c "Flying Scotsman". Retrieved 24 April 2015. ^ a b "Stephenson's 'Rocket' locomotive, 1829". The Science Museum. Archived from the original on 2007-09-18. ^ "Mallard". Archived from the original on 9 February 1999. Retrieved 24 April 2015. ^ a b "World Rail Speed Records". Retrieved 24 April 2015. ^ a b "The Gresley A4 Pacifics". Retrieved 24 April 2015. ^ "沪杭高铁最高时速再次刷新纪录达416.6公里_新闻中心_新浪网". News.sina.com.cn. Retrieved 2012-02-10. ^ "Archived copy". Archived from the original on 2008-09-07. Retrieved 2007-04-17. CS1 maint: Archived copy as title (link). ^ "Raggiunto in galleria il record mondiale di velocità di 362 km/h - Notizie - FSNews". Fsnews.it. Retrieved 2012-07-25. ^ "362km/h Nuovo Record di Velocità Italiano ETR Y1 500 di RFI Alta Velocità FI-BO 3/2/09 (HD)". YouTube. Retrieved 2012-07-25. ^ "Archived copy". Archived from the original on 2007-09-30. Retrieved 2007-04-15. CS1 maint: Archived copy as title (link). ^ a b c プロトタイプの世界 - Prototype World. Japan: Kōtsū Shimbunsha. December 2005. OCLC 170056962. ^ "Transporte Brasileiro - Mobility". Siemens. Archived from the original on 2011-10-02. Retrieved 2012-02-10. ^ "Gli ETR 200 FS". Interrail.publinet.it. Archived from the original on 2013-02-08. Retrieved 2012-07-25. ^ "Kein Folientitel" (PDF). Retrieved 2012-02-10. ^ Hans Dόcker. "Die Geschichte der Elektrolokomotive". E94114.de. Retrieved 2012-02-10. ^ "Birmingham Centre for Railway Research and Education - University of Birmingham" (PDF). Railway.bham.ac.uk. Retrieved 2012-02-10. ^ Берзин, Артур (2013-11-13). "Обогнавшие судьбу". Гудок. Retrieved 29 October 2015. ^ Рекордные испытания ТЭП80-0002 05.10.1993.TEP80 world speed record 271 km/h. YouTube. 19 March 2009. Retrieved 24 April 2015. ^ Barry, Keith. "From Simple Steam to Burly Turbines: 150 Years of Great American Trains". WIRED. Retrieved 24 February 2014. ^ "Mallard". Retrieved 24 April 2015. ^ "05 002 v Mallard. Notes on the data of the record runs: (1) 05 002". Retrieved 2015-07-15. ^ "GREAT SPEED Off THE CENTRAL. ; Empire State Express Engine Travels at the Rate of 112 1-2 Miles an Hour" (PDF). New York Times. 1893-05-12. Retrieved 2007-12-13. ^ "Lux's type collection - High Speed Trains - record runs". Boris-lux.de. Retrieved 2012-02-10. ^ "Opel". Astronautix.com. Archived from the original on 2012-05-03. Retrieved 2012-02-10. ^ "Opel-RAK". Daviddarling.info. Retrieved 2012-02-10. ^ "Speed Record Club". Speed Record Club. Archived from the original on 2012-02-11. Retrieved 2012-02-10. ^ "Pantograph testing in South Africa". Traintesting.com. Retrieved 2012-02-10. ^ a b YouTube. Retrieved 24 April 2015. ^ "International Space Hall of Fame :: New Mexico Museum of Space History :: Inductee Profile". Retrieved 24 April 2015. ^ "g17 train schedule | Train times, fares & tickets | Ctrip". english.ctrip.com. Retrieved 2018-05-23. ^ DVV Media Group GmbH. "World Speed Survey 2013: China sprints out in front". rwg. Retrieved 24 April 2015. ^ "Timetable for Tohoku Shinkansen". www.eki-net.com. Retrieved 2018-07-29. ^ UK, DVV Media. "World Speed Survey 1997". Railway Gazette. Retrieved 2018-02-15. This page was last edited on 10 April 2019, at 11:58 (UTC).